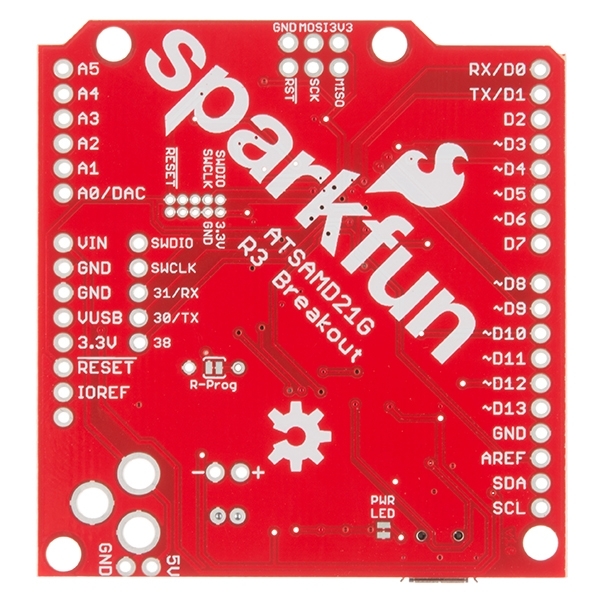 If you’re ready to step your Arduino game up from older 8-bit/16MHz microcontrollers, the SparkFun SAMD21 Dev Breakout is a great landing spot. 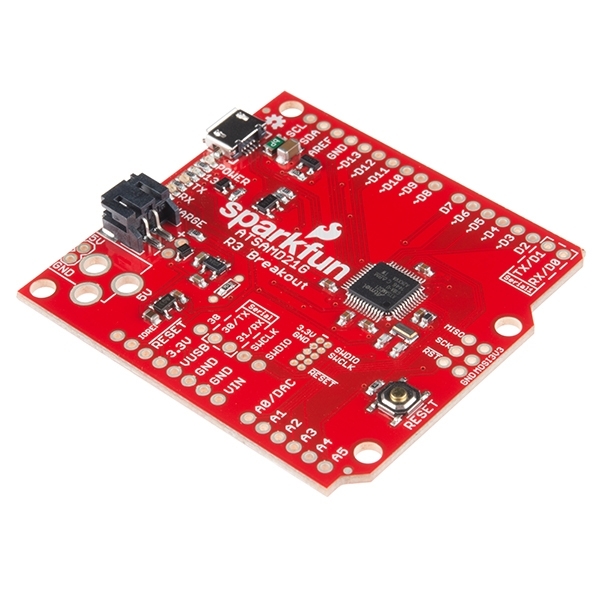 The SparkFun SAMD21 Dev Breakout is an Arduino-sized breakout for the Atmel ATSAMD21G18, a 32-bit ARM Cortex-M0+ processor with 256KB flash, 32KB SRAM, and an operating speed of up to 48MHz. This dev breakout provides you with an Arduino hardware option that solves the problems of low storage limits and dynamic memory stack overflows that have plagued the previous iterations of the Arduino family. 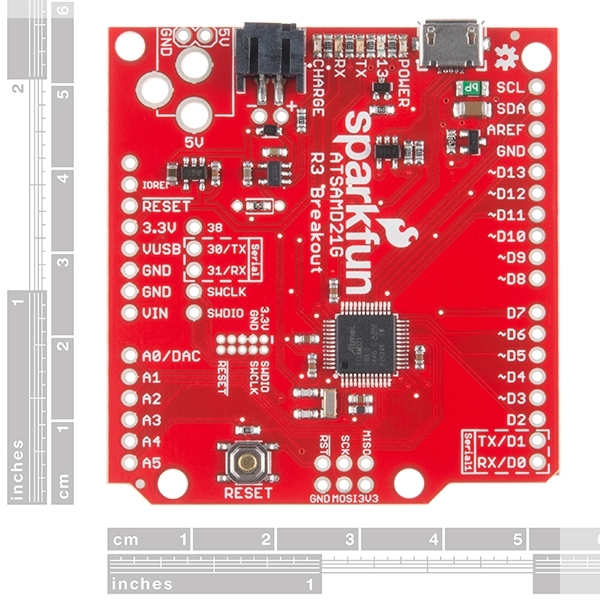 Yes, the SparkFun SAMD21 Dev Breakout is even fully supported in the Arduino IDE and libraries for the Arduino Zero! 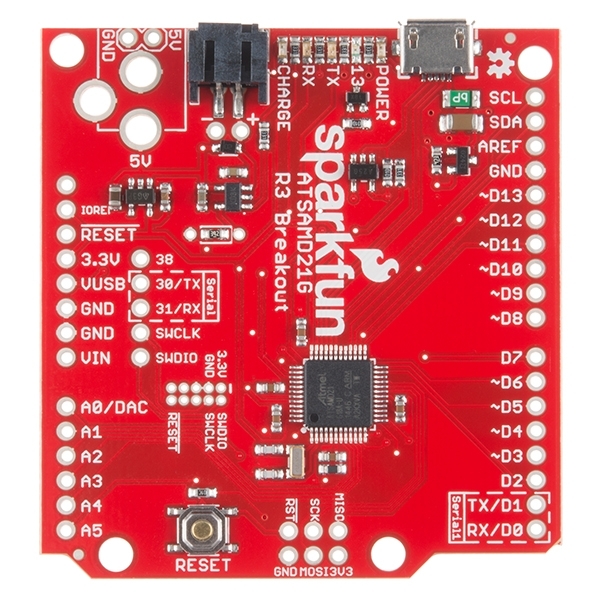 The SparkFun SAMD21 Dev Breakout has been equipped with a USB interface for programming and power, surrounded with an RTC crystal, and a 600mA 3.3V regulator. By utilizing the Pro R3’s extra PCB real-estate we’ve been able to leave room for a few extra GPIO pins and an integrated LiPo charger. To power the SAMD21 Breakout board, just plug it into a USB port on your computer via the micro-B port on the breakout. Not near a USB port? No problem, the SparkFun SAMD21 Dev Breakout is also equipped with a LiPo Battery connector (for a single-cell 3.7-4.2V litium-polymer battery) and unpopluated supply input to solder on your own PTH Barrel Jack. If you’ve used any Arduino before, this pinout shouldn’t surprise you – the layout meets the Arduino 1.0 footprint standard, including a separate SPI header and additional I2C header. One of the most unique features of the SAMD21 is SERCOM – a set of six configurable serial interfaces that can be turned into either a UART, I2C master, I2C slave, SPI master, or SPI slave. Each SERCOM provides for a lot of flexibility: the ports can be multiplexed, giving you a choice of which task each pin is assigned. The on-line SAMD21 Mini/Dev Breakout Hookup Guide (in theDocuments section below) contains step by step instructions of how to connect your SparkFun SAMD21 Dev Breakout as well as a few circuit examples to test out. Full example code is provided and explained and even includes troubleshooting tips to make make you have zero problems. Note: The breakout does NOT have headers installed and will need to purchased and soldered on yourself. Check the Recommended Products section below for the type of headers we use in the Hookup Guide!